I’ve read quite a few of Alison Weir’s historical biographies and am a big fan of her writing. 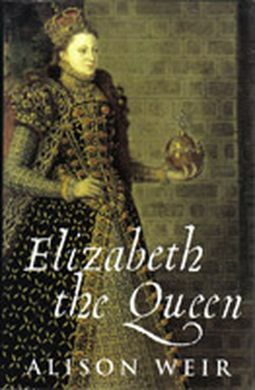 Elizabeth the Queen has been on the shelf for a long time. Well, most of the books I reading have been; either they get read straight after being bought or they go in the pile only to surface years later. Anyway, still largely reading non-fiction. I’m currently 30,000 words through my 120,000 word work-in-progress so I think the non-fiction streak will continue for a while. I enjoyed this a great deal. The writing is engaging and the court around Elizabeth comes to life quite vividly. I read this shortly before I read Fools and Mortals so I enjoyed having the real background to the setting. One of the interesting themes of the book is Elizabeth’s refusal to marry and the various factors that may have influenced that. In reality, Elizabeth had very little choice about who she might marry – there were few men equal in status to her, and most of them were Catholic. Of course, she showed little inclination to give up being supreme ruler of England. If she’d married her husband would have been her superior and she does not appear to have really believed that women were inferior to men. The prevailing opinion that women should not rule meant that she could never openly express that opinion so it must be inferred from her letters. Weir also posits that given the fate of her sister Mary and several of her father’s wives, Elizabeth may have subconsciously associated marriage with death. In her lifetime there were rumours of affairs and illegitimate children but they seem hardly credible in hindsight. I came away from the book thinking that she may have been asexual. Elizabeth clearly enjoyed flirting with men, as evidenced in her letters and contemporary accounts, and she had several emotional intense relationships, but did not seem to have to work terribly hard to repress her sexuality. There’s a lot more to the book than speculation about marriage, even though this is tightly bound up with her diplomatic relations with other countries. It gives a lot of information about the court and the characters present, about Elizabeth’s finances and the corruption inherent in the system of patronage that was the 16th century economy. There’s a lot of detail about how Elizabeth negotiated her way between her powerful neighbours, France and Spain, and cleverly avoided wars she couldn’t afford. War wasn’t always avoidable, but a different ruler might have gone to war much more frequently given the circumstances. I would highly recommend it. Informative, entertaining and very readable.